Tigers Eye is a form of quartz with some special characteristics. Like all quartz it is made up primarily of silicone dioxide, SiO2. Within this matrix are asbestos fibers usually occurring in layers. It is the asbestos that makes Tiger eye a chatoyant gemstone, meaning the fibers (asbestos) of the stone reflect in a wavering silky luster that can resemble the eye of a cat. The word Chatoyant comes from the French meaning “cat’s eye”. Tiger’s Eye can be found in several colors: yellow, red-brown, and blue being common. The blue variety is also known as Hawk’s Eye quartz. Blue Tiger’s Eye or Hawk’s Eye is formed when fibers of silicate form along side crocidolite. 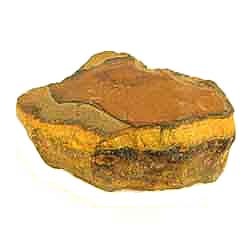 Tiger’s Eye has a hardness of 6 on the Mohs scale. Tigers eye is often used in jewelry, usually cut into cabochons to show off their chatoyancy. It is found in the US, Canada, Brazil, China, India, and Burma.